Tai Chi has been used as a complementary therapy in addition to more traditional Western healthcare approaches17 in several chronic conditions including cancer,18 ,19 cardiovascular diseases20–22 and arthritis.23 ,24 It has been shown that Tai Chi improves physiological and psychosocial outcomes in patients with chronic conditions.25 Given the fact that many middle-aged and older persons have more than one chronic condition,26 ,27 it is important to synthesise the effectiveness of interventions across several comorbidities rather than reporting its effects solely within a single condition. The high prevalence of multimorbidity is demonstrated by a study of 980 Canadians reported that 9 of the 10 individuals had more than one chronic condition; 70% of younger adults (aged 18–44 years) had more than one chronic condition and this prevalence rose to 98% in adults who were 65 years of age and older.28 Further, loss of function and physical limitations have been identified by patients as problem areas. Since Tai Chi can improve several attributes of fitness, it has potential as an exercise regimen for older individuals with multimorbidity. We aimed to summarise current evidence regarding the effectiveness of Tai Chi in individuals with four common chronic conditions—cancer, osteoarthritis (OA), heart failure (HF) and chronic obstructive pulmonary disease (COPD)—some of these four chronic conditions may coexist. We included articles on conditions that had Tai Chi applied as an exercise intervention and met the inclusion criteria. Several conditions preliminarily searched for, that is, lung cancer, ischaemic heart disease, did not reveal any reports and thus were not considered in this systematic review. The evidence from this review will inform healthcare practitioners of important considerations when prescribing Tai Chi to people with multimorbidity, especially in older adults. This systematic review addressed the following questions: (1) Is Tai Chi an effective physical activity that improves symptoms, physical function, quality of life and depression in cancer, OA, HF and COPD? (2) Does Tai Chi have similar effects for the same outcome measures across different chronic conditions? The following electronic databases were searched from their inception until 30 December 2014: MEDLINE, EMBASE, CINAHL and SPORTDiscus. Medical Subject Headings (MeSH) terms were employed to perform the search to retrieve citations and abstracts. “Tai Chi” was combined with each of the four chronic conditions: “cancer,” “osteoarthritis,” “heart failure” and “chronic obstructive pulmonary disease.” The search strategy of each database is listed in online supplementary appendix 1. Additional searches were carried out by scanning the reference lists of related articles. Inclusion criteria for articles were studies that: (1) had participants with cancer or OA or HF or COPD; (2) used any form of Tai Chi, for example, modified Tai Chi or Qigong Tai Chi, as an intervention; (3) had a control group, other treatments or another exercise intervention as a comparison group; (4) reported outcomes of symptoms related to the respective chronic condition or outcomes of exercise training and (5) used a randomised controlled trial (RCT). Studies were excluded if they were not written in English. Initially, two reviewers independently screened the titles and abstracts retrieved from the four databases. Next, two reviewers independently conducted full-text reviews and finally data abstractions. Disagreements were discussed between the two reviewers at each stage. A third reviewer was consulted to mediate decisions if consensus was not reached. The following information was extracted in data abstraction forms: first author, year of publication, study purpose, participant characteristics, chronic conditions and diagnostic criteria, the details of Tai Chi (type, number of forms, duration, frequency, training length), details of comparison groups and outcomes (preintervention, postintervention and change scores, if available). The quality of included studies was assessed using the Physiotherapy Evidence-Based Database (PEDro) scale,29 which demonstrates good reliability.30 The PEDro scale consists of 11 criteria: eligibility criteria, random allocation, concealed allocation, baseline similarity, blinding of participants, blinding of therapists, blinding of assessors, follow-up, intention-to-treat analysis, between-group statistical comparisons, and point measures and measures of variability. One point is given for reporting of each criterion except item 1 (which refers to eligibility criteria) for a maximum score of 10. Two reviewers independently assessed the study quality and disagreements were discussed until consensus was reached. Data were analysed using RevMan 5.2 (http://tech.cochrane.org/revman/download). Meta-analyses were performed when at least two studies reported similar outcomes. Meta-analyses were performed on disease-specific symptoms, physiological outcomes and the physical performance of each chronic condition. Subgroup analyses on disease-specific symptoms were conducted by categorising studies into subsets based on the type of comparison groups. For example, Tai Chi was compared with a control group in some studies, whereas in others the comparison group was another type of intervention. Thus, subgroup analyses were performed on each of these comparison groups. The overall effect for all studies, regardless of the comparison group, was calculated when no heterogeneity existed between subgroups. Standardised mean difference (SMD) was used if the outcome was measured in a variety of ways. Mean difference (MD) was used if the outcome measurements were carried out using the same methodology. Inverse variance methods with a random effects model were used in the meta-analyses. The effect size of each study was presented as either SMD or MD with 95% CI. A p value of less than or equal to 0.05 was considered statistically significant for an overall effect. Heterogeneity among studies was identified using χ2 test and a p value of <0.10 was used to indicate significant heterogeneity among studies. 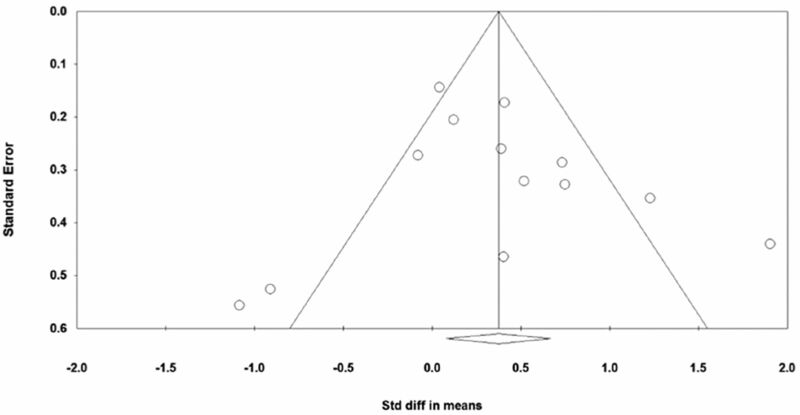 Publication bias was assessed by visually examining a funnel plot. In addition, funnel plot asymmetry was statistically tested by Egger's test using Comprehensive Meta-Analysis (CMA) software V.2.2.064 (Biostat, Englewood, New Jersey, USA). A p value of <0.05 indicated the significance of publication bias. Searches of electronic databases produced 1102 citations (figure 1). Duplicates were excluded and reference lists yielded an additional five publications. Forty-one full-text articles were identified as potential inclusions after review of titles and abstracts. After full-text reviews, eight reports were excluded due to insufficient information or duplication of a conference proceeding (figure 1). Thirteen articles appeared to be similar in methodology but reported different outcome data in two or more publications.18 ,19 ,21 ,23 ,34 ,35 ,41 ,46 ,47 ,49–52 These were counted as individual studies in order to facilitate citation of outcome data. However, these reports were grouped in tables that described quality assessment (table 1) and participant characteristics (table 2). Of note, the search only revealed articles that reported the effect of Tai Chi for patients with breast cancer. Its use was not reported for any other types of cancer. Flow chart showing different phases of the search strategy, screening and selection of studies (COPD, chronic obstructive pulmonary disease; HF, heart failure; OA, osteoarthritis; RCT, randomised controlled trial). The median PEDro score for included studies was 5 (IQR 5–6.75) (table 1). Owing to the nature of Tai Chi, blinding of respondents and therapists (PEDro items 5 and 6) is challenging and was not reported in all included studies. One study40 blinded assessors (PEDro item 7), whereas other studies utilised self-report outcomes, such that the participants were the assessors and hence nullified the possibility of a blinded assessor. Only one study32 scored 1 point on the PEDro scale and was excluded from quantitative syntheses due to missing data. Regarding the type of Tai Chi, the Yang style was used in 10 of the 24 studies (2 cancer32 ,41; 3 OA31 ,36 ,44; 4 HF43 ,52 ,55 ,58 and 1 COPD42). Sun style Tai Chi was used in four OA studies23 ,33 ,37 ,38 and two COPD studies.56 ,57 Wu style Tai Chi was taught in only two studies (1 OA54 and 1 HF22). The type of Tai Chi was not stated in six studies.24 ,34 ,39 ,40 ,45 ,53 The Tai Chi training programme ranged from 6 to 24 weeks and most were of 12-week duration. Session length ranged from 30 to 90 mins and most were of 1 h duration. Tai Chi training was usually offered 2–3 times per week. However, three studies39 ,53 ,54 provided Tai Chi once weekly and in one study,40 participants were asked to attend Tai Chi training every day. Usual care or waitlist control was the most common comparison group,22–24 ,33 ,35–37 ,39 ,40 ,42 ,52 ,53 ,56 ,57 followed by comparison to another exercise intervention programme.31 ,32 ,55 ,58 The effectiveness of Tai Chi was compared with that of educational programmes in four studies.38 ,43–45 One cancer study41 used psychosocial therapy as the comparison and one OA study54 used a non-physical recreational activity as the comparison group. Six-minute walking distance (6MWD) test was performed in cancer, OA, HF and COPD studies (figure 2). Analyses by each chronic condition demonstrated a favourable effect of Tai Chi on 6MWD in HF (SMD=1.58; 95% CI 0.70 to 2.45; p=0.0004) and COPD (SMD=0.37; 95% CI 0.01 to 0.73; p=0.05) studies, and trends towards improvement in one cancer report (p=0.09) and one OA (p=0.11) report. Forest plot for effects of Tai Chi on 6MWD (6MWD, 6-min walking distance; COPD, chronic obstructive pulmonary disease; HF, heart failure; OA, osteoarthritis). Knee extensor strength was assessed in OA, HF and COPD studies (figure 3). The subgroup (each chronic condition) difference was significant (p=0.0009); Tai Chi improved strength even more so than the comparison group in one HF study (SMD=1.14; 95% CI 0.60 to 1.69; p<0.0001) and one COPD study (SMD=1.64; 95% CI 0.90 to 2.39; p<0.0001), but it only showed a trend towards improvement in the OA studies (p=0.13) (figure 3). Forest plot for effects of Tai Chi on knee extensor strength (COPD, chronic obstructive pulmonary disease; HF, heart failure; OA, osteoarthritis). The aggregated data of the OA studies showed a favourable effect of Tai Chi versus the comparison groups on the Timed Get Up and Go (TUG) test (MD=0.56; 95% CI 0.09 to 1.03; p=0.02). However, the HF study did not provide comparable evidence (p=0.78) (figure 4). Forest plot for effects of Tai Chi on TUG test (HF, heart failure; OA, osteoarthritis; TUG, Timed Get Up and Go). Meta-analyses performed on each chronic condition showed a significant effect of Tai Chi in OA studies (SMD=0.38; 95% CI 0.01 to 0.75; p=0.05), and an improving trend for COPD and HF studies (p=0.08; p=0.18, respectively), whereas the cancer (p=0.62) study did not provide evidence of Tai Chi improving quality of life more so than the comparison groups (figure 5). Forest plot for effects of Tai Chi on quality of life (COPD, chronic obstructive pulmonary disease; HF, heart failure; OA, osteoarthritis). 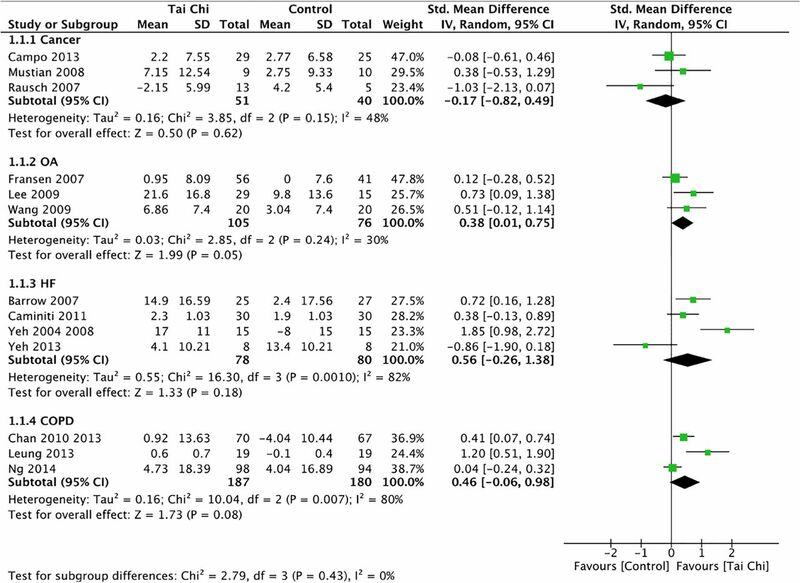 Meta-analyses examining each of the chronic conditions only demonstrated a favourable effect of Tai Chi improving depression more so than the comparison groups in the HF studies (SMD=0.56; 95% CI 0.07 to 1.05; p=0.03). Tai Chi showed a non-significant trend in COPD (p=0.09) and OA (p=0.32) studies. Of note, the two cancer studies demonstrated an effect in favour of the other treatment, which included stress management, on depression (SMD=−0.97; 95% CI −1.90 to −0.05; p=0.04) (figure 6). Forest plot for effects of Tai Chi on depression (COPD, chronic obstructive pulmonary disease; HF, heart failure; OA, osteoarthritis). Two meta-analyses examined two major symptoms of OA, pain and stiffness. 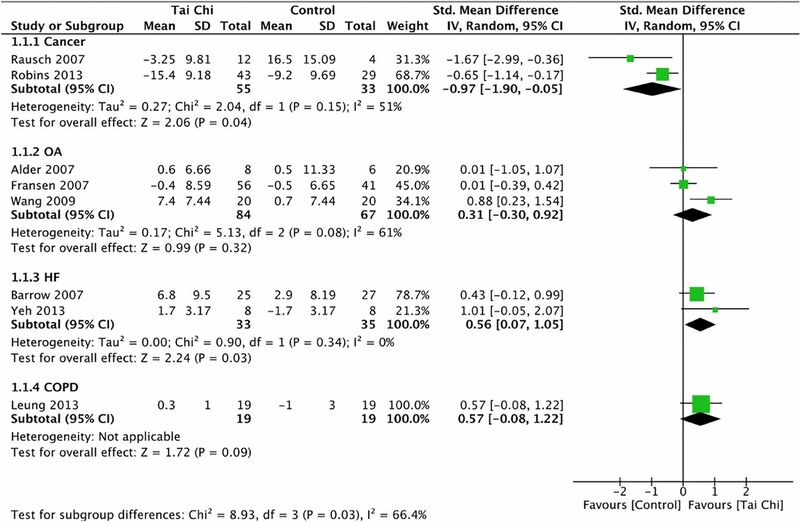 The meta-analyses, regardless of the comparison groups, showed evidence of Tai Chi improving pain (SMD=0.53; 95% CI 0.32 to 0.75; p<0.0001) (figure 7A) and stiffness (SMD=0.59; 95% CI 0.31 to 0.87; p<0.0001) (figure 7B). Subgroup analyses were performed that evaluated the effectiveness of Tai Chi compared with another intervention or compared with no intervention. Positive effects in favour of Tai Chi on pain were shown with either comparison group: other interventions (SMD=0.55; 95% CI 0.09 to 1.01; p=0.02) or no interventions (SMD=0.51; 95% CI 0.24 to 0.79; p=0.0003) (figure 7A). 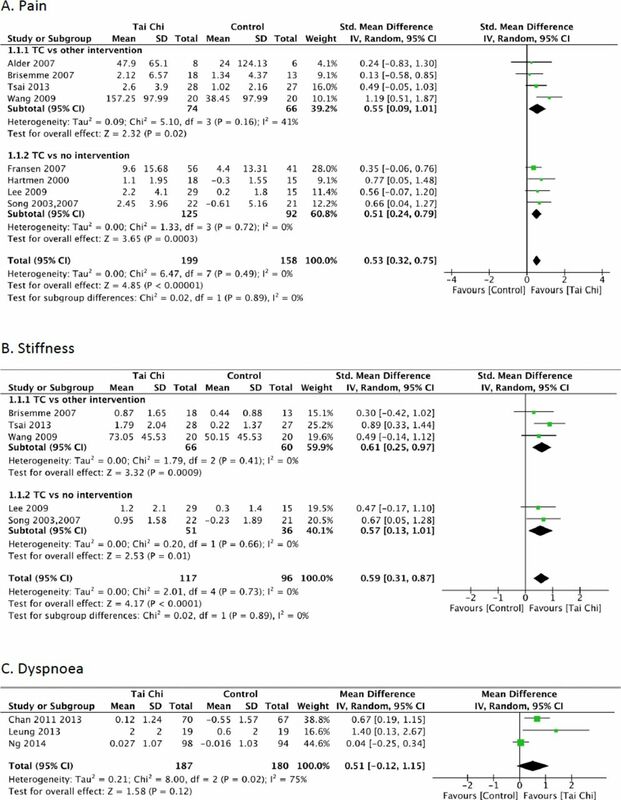 Similarly, subgroup analyses showed a favourable effect of Tai Chi on stiffness regardless of the comparison group: other interventions (SMD=0.61; 95% CI 0.25 to 0.97; p=0.0009) and no interventions (SMD=0.57; 95% CI 0.13 to 1.01; p=0.01) (figure 7B). Forest plot for effects of Tai Chi on disease-specific symptoms: (A) pain; (B) stiffness; (C) dyspnoea. In COPD studies, meta-analysis showed a non-significant trend of Tai Chi alleviating dyspnoea versus the comparison groups (MD=0.51; 95% CI −0.12 to 1.15; p=0.12) (figure 7C). Meta-analyses could not be performed for cancer symptoms because no two studies reported similar outcomes. One study32 showed a trend of 75% participants experiencing less fatigue, measured by the Brief Fatigue Inventory (BFI), after either a 6-week Tai Chi or walking programme, but the small sample size (n=8) most likely limited statistical power. The meta-analysis of two HF studies revealed no evidence that Tai Chi improved either systolic blood pressure (SBP) (p=0.80) (figure 8A) or diastolic blood pressure (DBP) (p=0.33) (figure 8B). In addition, the meta-analysis of the other two HF studies reported a non-significant difference in peak oxygen uptake (VO2peak) from Tai Chi compared with either an exercise or a comparison group (p=0.34) (figure 8C). 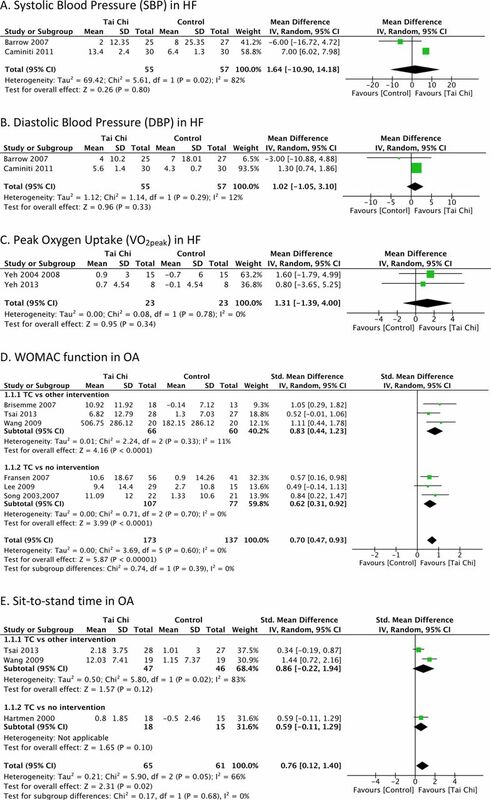 Forest plot for the effects of Tai Chi on physiological outcomes for heart failure (HF): (A) systolic blood pressure; (B) diastolic blood pressure; (C) peak oxygen uptake and osteoarthritis (OA): (D) WOMAC function; (E) sit to stand time. 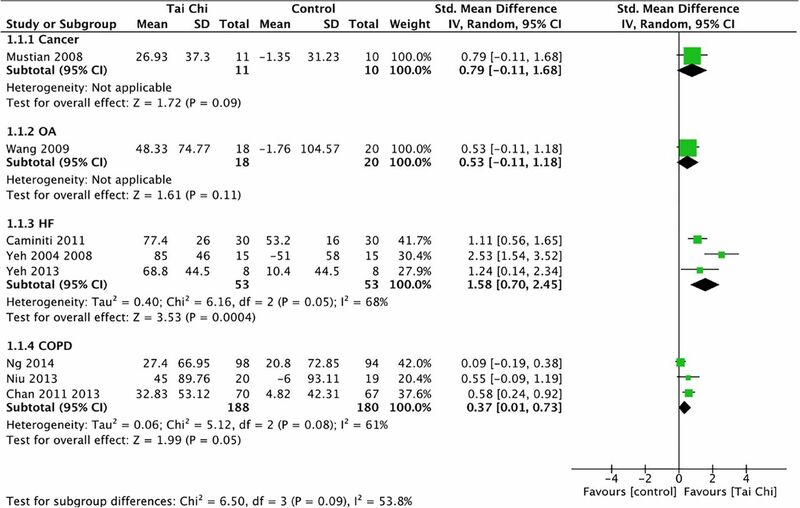 Meta-analysis of physical function in participants with OA assessed using the WOMAC showed a favourable effect of Tai Chi on improving physical function in participants with OA (SMD=0.70; 95% CI 0.47 to 0.93; p<0.00001) (figure 8D). In addition, Tai Chi improved sit-to-stand times more so than the comparison groups (SMD=0.76; 95% CI 0.12 to 1.40; p=0.02) (figure 8E). Funnel plot for quality of life. The most important findings of this systematic review and meta-analyses on 33 studies and 1584 participants were that Tai Chi showed favourable effects or modest trends on improving 6MWD, knee extensor strength and quality of life in most or all four chronic conditions: cancer, OA, HF and COPD. Our findings support the results of a previous systematic review that showed the effectiveness of Tai Chi on health outcomes in older patients with chronic conditions.25 These findings also complement previous systematic reviews that only examined the effect of Tai Chi in a single chronic condition.59–62 Moreover, Tai Chi provided greater improvements than comparison groups in other physical performance measures including decreased TUG times and shorter sit-to-stand times in participants with OA. Finally, Tai Chi was more effective for improving pain and stiffness in OA compared with other interventions or controls. Meta-analyses demonstrated that Tai Chi was more effective or showed modest trends compared with controls or other intervention groups towards improving the 6MWD in four chronic conditions. The 6MWD is a common primary outcome measure that is considered to evaluate functional exercise capacity.63 It shows moderate-to-high correlations with outcomes from peak cardiopulmonary exercise tests in participants with cardiac diseases64 and COPD63 and has also been shown to increase after resistance training in participants with chronic HF.65 The positive effect and trends of the 6MWD in all four conditions provide evidence that the exercise overload induced by Tai Chi was sufficient to improve functional exercise capacity in these chronic conditions. Tai Chi improved the knee extensor muscle strength in participants with HF and COPD, but only showed a tendency towards improvement in participants with OA compared with other comparison groups and was not measured in participants with breast cancer. Although participants with knee OA have lower knee muscle strength,66 this impairment might be less than the weakness demonstrated in participants with HF67 and COPD,68 and thus a greater overload may be required than that provided by Tai Chi. Hence, Tai Chi appears to improve knee extensor strength in HF and COPD with more marginal benefits in OA. Further study is required to realise its impact on knee extensor strength in cancer survivors. Other physical performance measures that require knee extensor strength improved more so after Tai Chi than other comparison groups in participants with OA. Most notably, TUG and sit-to-stand times showed greater improvements after Tai Chi than comparison groups in participants with OA. These findings may be attributed to the multifaceted training stimuli of Tai Chi that is directed towards improving balance and postural alignment in addition to strength.5 Although Tai Chi provides a minimal strength training stimulus, its positive influence on TUG and sit-to-stand times provides strong evidence of its clinical impact on important functional measures in participants with OA. In addition to the improvement in physical performance measures, symptoms either improved or did not differ after Tai Chi compared with the other treatment or a control group. Pain and stiffness in OA showed greater improvements after Tai Chi and dyspnoea showed a trend towards improvement in participants with COPD. Improved pain and stiffness in participants with OA may be attributed to increases in muscle strength, balance and/or postural alignment.70 From a clinical perspective, this evidence provides some assurance to the health professional that prescription of Tai Chi to persons living with OA and COPD has the potential to improve functional exercise capacity, but not at the expense of aggravating pain or causing undue dyspnoea. This meta-analysis has some limitations. First, only studies published in English were included due to the lack of two reviewers who were fluent in other languages. Second, with the exception of OA, there were limited numbers of RCTs in the other chronic conditions, especially regarding the availability of raw data that could be included in the meta-analyses. Third, the sample sizes of included RCTs were quite small, contributing to limited power in most studies and in the aggregated data examined by meta-analyses. For example, the conflicting findings of the effect of Tai Chi on blood pressure in participants with HF are difficult to interpret because both reports had a small sample size.22 ,58 A fourth limitation is that participants in most studies represented patients who had one primary condition and may have excluded individuals with multimorbidity. Further study examining the effects of Tai Chi on multimorbidity is required to substantiate its benefits in this potentially complex patient group. Finally, the diversity of the type and parameters of Tai Chi in the included studies also limits the ability to make firm conclusions regarding the recommended Tai Chi exercise prescription for each chronic condition. A key strength of this meta-analysis was the examination of the evidence regarding Tai Chi by reporting the symptoms, physiological and exercise outcomes of four common chronic conditions. Individuals with different chronic conditions may have different mechanisms that contribute to symptoms, impaired physical performance or quality of life. However, in people with multimorbidity, these underlying factors may also be inseparable or difficult to identify. Therefore, this systematic review offers a reasonable starting point to begin the quest for determining alternative exercise protocols, such as Tai Chi, for individuals who live with multimorbidity. Most of the included studies were moderate-to-high quality in terms of methodology (PEDro=4–7). Only one included study had poor quality32 and was excluded from quantitative syntheses due to missing data. This systematic review provided a quantitative synthesis of important physical performance outcomes, symptoms and quality of life. For some measures, evidence was limited due to the diverse outcome measurements among the conditions and small sample size. More rigorous RCTs with larger sample sizes are required to confirm the inconsistent findings among the included studies. Also, studies that examine patients with a broader range of diagnoses are required. For example, all of the studies examining cancer in this systematic review involved participants with breast cancer. It would be worthwhile to assess the effectiveness of Tai Chi on other types of cancer. In conclusion, the results provided evidence regarding a favourable effect or tendency of Tai Chi on improving the performance of 6MWD, knee extensor strength and quality of life in people with cancer, OA, HF and COPD. Additionally, the meta-analyses showed the favourable effects of Tai Chi versus other interventions or no treatment on several disease-specific symptoms, including pain and stiffness. Taken together, Tai Chi demonstrates improvement in functional exercise capacity in individuals with different chronic conditions without aggravating symptoms of pain and dyspnoea. To summarise, Tai Chi appears to provide an adequate exercise stimulus and it could be a suitable exercise to prescribe for people with several comorbidities that include COPD, HF and OA. Tai Chi can improve some physical performance outcomes in four chronic conditions (cancer, osteoarthritis, heart failure and chronic obstructive pulmonary disease) but not at the expense of worsening pain or dyspnoea. Tai Chi may provide a suitable exercise stimulus for people with several comorbidities. It is possible to consider prescribing Tai Chi in people with multimorbidity. Tai Chi is an exercise that is suitable to improve physical performance in middle-aged and older adults. Tai Chi can be a complementary therapy in some chronic conditions. The authors would like to thank the following people for providing data required to perform the meta-analyses: Sang-Cheol Bae, Jean-Michel Brismée, Aileen W K Chan, Jo Lynne W Robins, Chwan-Li Shen, Rhayun Song and Pao-Feng Tsai. They also acknowledge Alka Kurra and Carmen Ma for their assistance with data extraction and proofreading the manuscript.
. Tai Chi Chuan: the code of life revealing the deeper mysteries of China's ancient art for health. London, GBR: Jessica Kingsley Publishers, 2008.
. A pilot study to assess the influence of Tai Chi Chuan on functional capacity among breast cancer survivors. J Support Oncol 2006;4:139–45.
. Effects of Tai Chi exercise on pain, balance, muscle strength, and perceived difficulties in physical functioning in older women with osteoarthritis: a randomized clinical trial. J Rheumatol 2003;30:2039–44. PEDro scale. http://www.pedro.org.au/english/downloads/pedro-scale/ (accessed Oct 2013).
. The effects of Tai Chi and walking on fatigue and body mass index in women living with breast cancer: a pilot study. Rehabil Oncol 2003;21:17–22.
. Tai Chi exercise for patients with chronic obstructive pulmonary disease: a pilot study. Respir Care 2010;55:1475–82.
. Cochrane handbook for systematic reviews of interventions Version 5.1.0 [updated March 2011]. The Cochrane Collaboration, 2011. http://www.cochrane-handbook.org (accessed Jan 2014).
. Effects of a Sun-style Tai Chi exercise on arthritic symptoms, motivation and the performance of health behaviors in women with osteoarthritis. Taehan Kanho Hakhoe Chi 2007;37:249–56.
. Evaluating the psychosocial effects of two interventions, Tai Chi and spiritual growth groups in women with breast cancer [dissertation]. Richmond, VA: Virginia Commonwealth University, 2007.
. The effects of Tai Chi on pain and function in older adults with osteoarthritis [dissertation]. Cleveland, OH: Case Western Reserve University, 2007.
. Tai Chi enhances the effects of endurance training in the rehabilitation of elderly patients with chronic heart failure. Rehabil Res Pract 2011;2011:761958. doi:10.1155/2011/761958 (accessed May 2014).
. Exercise and heart failure. Minerva Cardioangiol 2004;52: 537–46. Contributors Y-WC and WDR contributed to the conception and design of this systematic review. Y-WC conducted the search and analysed the data. Y-WC, MAH, KLC, KP and WDR extracted the data and completed the methodological quality assessment. Y-WC was primarily responsible for writing the manuscript. MAH, KLC, KP and WDR critically revised the manuscript. Funding Y-WC is funded by the University of British Columbia and the BC Lung Association.